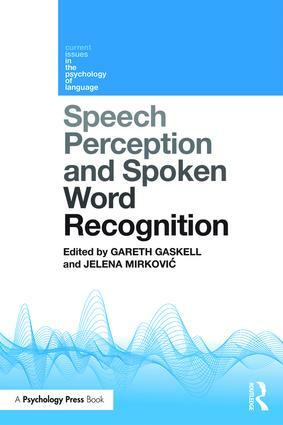 Speech Perception and Spoken Word Recognition features contributions from the field’s leading scientists, and covers recent developments and current issues in the study of cognitive and neural mechanisms that take patterns of air vibrations and turn them ‘magically’ into meaning. The volume makes a unique theoretical contribution in linking behavioural and cognitive neuroscience research, and cutting across traditional strands of study, such as adult and developmental processing. Overall this book presents a renewed focus on theoretical and developmental issues, as well as a multifaceted and broad review of the state of research, in speech perception and spoken word recognition. Particularly interested readers will be researchers of psycholinguistics and adjoining fields as well as advanced undergraduate and postgraduate students. Perception and production of speech: Connected, but how?